The township of Grassy owes its origins solely to the mining of scheelite. It has proved to be a volatile industry, with Grassy’s fortunes following a similar boom and bust pattern. Mining started in the early 1900’s, and after a decline in the 20’s, increased dramatically in the 40’s. There was a decline in mining after World War Two. But the pendulum swung back in the late 1950’s. 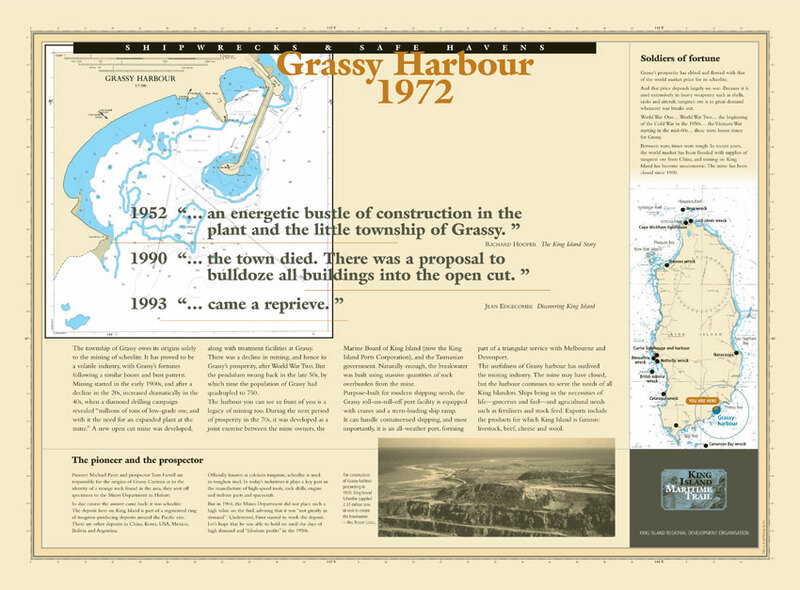 The period of prosperity in the 70’s lead to the development of Grassy Harbour, with the breakwater being built using massive quantities of rock overburden from the mine. Purpose-built for modern shipping needs, the Grassy roll-on-roll-off port facility is equipped with cranes and a stern loading ramp. It can handle containerised shipping and forms part of a triangular service with Devonport and Melbourne. The usefulness of Grassy harbour has outlived the mining industry. The mine may have closed, but the harbour continues to serve the needs of all King Islanders. ships bring in the necessities of life – groceries, fuel – and agricultural needs such as fertilisers and stock feed. Exports include the products for which King Island is famous: livestock, beef, cheese and kelp.